It’s Spring time and heading into Summer time shortly. We have already seen volatile weather all over the place. And what happens when the weather turns nasty? Power outages. I find it distressing to be in the middle of a storm and be without power but I become even more stressed if I’m in the dark. As you all know I also have a little one. Peyton cannot deal with being in complete darkness. I have several night lights throughout our home so if she does wake up in the middle of the night there is always light. Now if she’s awake and the power goes out and we are in the dark Peyton panics. That takes the stress level up one more notch. Nothing like trying to find a flashlight or candles and matches with a child clinging to you. 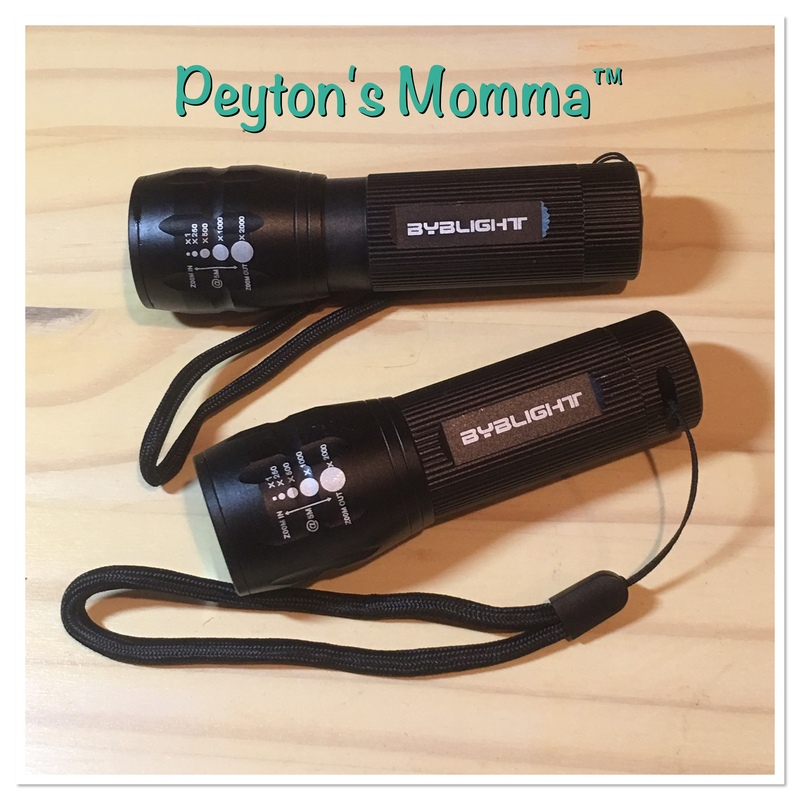 ByBlight has these wonderful little flashlights which are prefect to keep in nightstand drawers, purses or any place that would be easy to access during a power outage. Another wonderful aspect of these flashlights is the power they have. Powered by 3 AAA batteries you get some serious light out of them. There is also an adjustable feature which can narrow the light similar to a torch or have a wide light like a traditional flashlight or anywhere in between. These flashlight also have a strobe feature. Each light puts out 150 lumens which is a powerful bright light. Do not make the mistake of looking into the flashlight. I did it. I just wanted to see how bright it was. Well, with just the few seconds I looked in the light all I could see where spots when I first looked away. It’s a powerful flashlight. The wrist strap makes these perfect for camping, emergency use or everyday use. The strap keeps the flashlight securely attached to you so if you trip or drop it you will not loose the light. Each flashlight is water resistant making these functional for outdoor use. 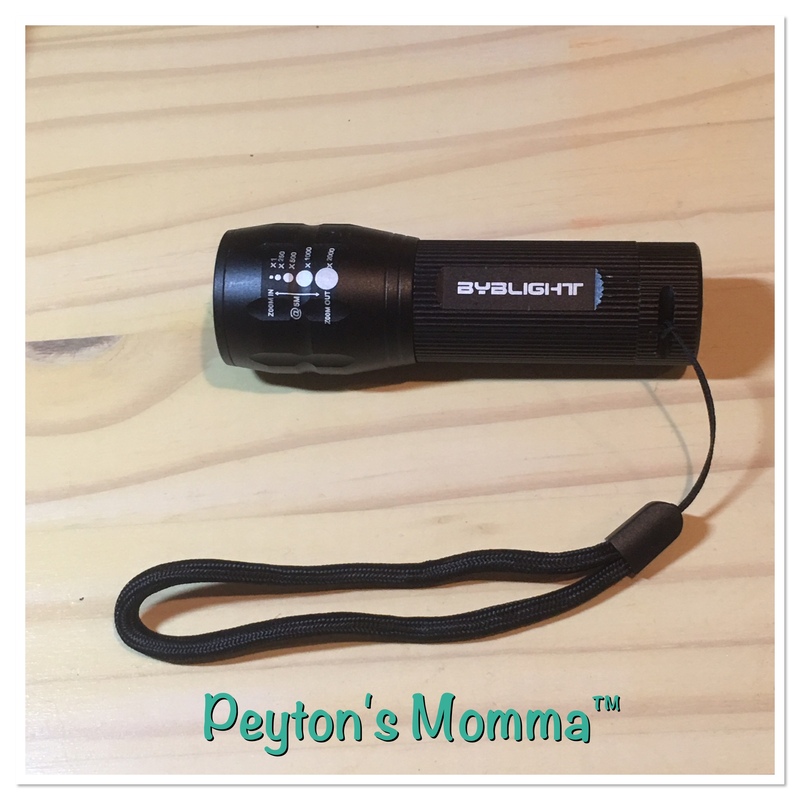 I was extremely impressed with the ByBlight flashlights. With tornado season upon us I will be keeping these flashlights throughout the house for when the power fails. You can purchase your own set on Amazon. I like a couple of stand-by flashlights in the house for emergencies and one in the car. These look like a good option. I gave my granddaughters a flashlight this past year. I was amazed at the reactions. Happy, happy, happy.